Students of all ages need a practice that is suited to their unique constitution, temperament, and interest. All children and adults at all levels of sensory functioning benefit from the strengthening, balancing, and toning effect yoga has on the nervous system. In a nutshell, yoga helps with sensory integration. The sensory system is soothed, and the relaxation response (parasympathetic dominance) is engaged in forward folds; deep, even breathing; progressive relaxation (tensing then releasing each muscle group); and deep relaxation. Most children in my classes also love to put sandbags on their bodies for final rest. This is especially helpful for a child with sensory processing challenges. An eight-year-old boy in my class, whose mom signed him up to address “sensory issues,” let out a series of five or six “Ahhhs” when I placed a sand bag on his chest. (Make sure the sandbags are not too heavy; check in with the child and look for easy, relaxed breathing. Leave them on for five minutes or less.) He had been irritable and very talkative during class. After relaxation, his face was soft, he smiled gently, and when I asked him how he was feeling, instead of launching into a dramatic high-energy story, as is his tendency, he just nodded his head as his smile widened. Brooke S. Backsen, MOT, OTR/L, RYT describes this as DTP, deep touch pressure. “This is the most calming form of input.” It also increases body awareness, as there is increased sensory input across large surface areas of the body. Children with Sensory Processing Disorder (SPD) often have weighted blankets to help them sleep at night. Better body awareness is one of the greatest benefits of the yoga practice. Children get excellent proprioceptive and vestibular input through partner poses, walking around like bears and dogs (hands and feet on the floor), and in twisting poses that compress the muscles. The repetitive and soothing motions of vinyasa flow can be helpful for a child who feels too much sensory input, but difficult for a child who has trouble processing proprioceptive or vestibular input. 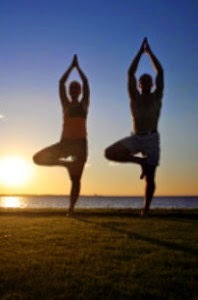 Standing and balancing poses help develop stability, strength, and coordination. Poses such as tree, eagle, and dancer provide much-needed joint compression. Moving from backbends to forward bends to twists gives the vestibular system rich input, which helps a child feel calm and grounded. This all makes it easier for children to feel more comfortable and present in their body. She recommends ujjayi breathing and alternate nostril breathing. Breathing practices we teach children, including balloon breath, flower hands breath, and open wings also help soothe and balance the whole nervous system while facilitating the relaxation response (Binzen, Mira). The technique of pratyahara, or sense withdrawal, is listed right along with asana (yoga postures) in the eight limbs of yoga in The Yoga Sutras of Patanjali. It is an integral part of the practice and is the first step to mastering the mind. One of the most beautiful and sacred texts in the yoga tradition, The Bhagavad Gita, says it plainly: “Even as a tortoise draws in its limbs, the wise can draw in their senses at will” (verse 2.58, translation from The End of Sorrow by Eknath Easwaran). For someone who is more sensitive than others, or who has a difficult time making sense of what they do perceive, withdrawing the senses and focusing within can be a monumental task. The breathing exercises and postures of yoga help a child get to a place where meditation is more accessible. If the same effort was put into practicing concentration as is given to developing other life skills, such as teeth brushing, bike riding, and playing an instrument, our children would be relieved of a tremendous amount of stress and confusion. Just like brushing your teeth, you will continue to do it every day for life. Just like practicing an instrument, a little bit every day leads to mastery. The mind is an instrument, and concentration and meditation are the practices that lead to self-mastery. Whether someone has been given a diagnosis of SPD or not, we are all having our senses assaulted by the fracas of modern living and can benefit tremendously from the multifaceted practice of yoga. Mira Binzen has a degree in Child Psychology and is a certified yoga teacher, yoga therapist, and co-founder of Global Family Yoga™, a teacher-training program based in Chicago, focusing on children and families.